My Glass Wings stained glass art studio is owned and operated by stained glass designer Tina Montgomery. 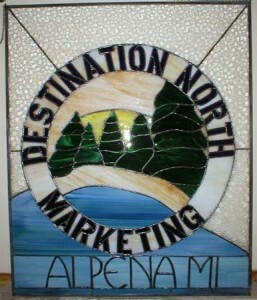 As a stained glass artist, Tina has created custom stained glass windows, doors, cabinets, signs and more. Some of the custom pieces made at My Glass Wings include breakfast nook windows from an artist's drawing, windows for churches, large name signs for business windows, signs from business cards logos and organizational emblems, fused tabletop for a small European side table, etc. Adventure has been found creating what our customers are looking for, maybe not traditional, but stained glass all the same. Custom orders are an interactive process. Discussions about style, colors and dimensions are combined in the design process. Windows, cabinets, doors, sidelights, church windows, original design panels large and small - are all options. We can make stained glass art using a variety stained glass techniques and styles including lead came or copper foil, traditional or contemporary, fused or slumped, etc. Prices are based on square footage, calculated on the various cost of glass, supplies and size with your project budget in mind. 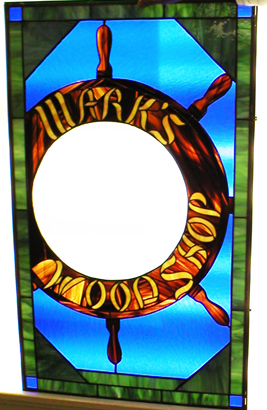 We will work with you to create a custom stained glass design, making your vision a beautiful piece of art. To schedule a meeting at MGW, your home or business, or contact us by e-mail or telephone. We do not charge for consultations, but do require a fee before starting on your design.